Exercises in standard notation with fingerings, TAB and chord diagram form. This fun and challenging class combines altered sounds and major and minor triad pairs from melodic minor with loads of counterpoint. 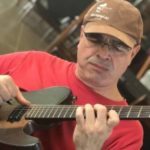 The eight pages of written examples are comprised of ii-V-I examples in several keys that employ low open strings, perfect for solo guitar, comping, and chord soloing. Included is a chord grid page of “visualizations”, a quick way to memorize altered sounds over dominant 7ths using major and minor triad pairs. You won’t hear II-V-I’s the same after working with this class! In my previous harmonized melodic minor scale class, strings of triads and seventh chords were put together and used for comping and chord soloing. Now we’ll take those chords and give them a thorough workout with all types of line motion utilizing the Van Eps super and sub series in all possible voices. This can really add a lot of interest on top of something that is already harmonically pleasing. And most importantly the sound will get in the ears, and in turn, the hands of the player. After working with the techniques in this class for a while in practice and performance you’ll be ready to explore open voiced or spread triads in part two of the class. Wrap your fingers around some fun and ear opening sounds used for years by the great pianists. Yet another excellent offer from Steve Herberman. If you have bought the previous classes it makes a lot of sense to build on what you’ve worked on by learning, transposing, dismembering and putting back together the materials in this class. The contrapuntal concepts are here applied to triad pairs from the scale of the ii (dorian), v (altered / mel minor) and I (ionian or Lydian. Interesting to see how triads are linked together through the progressions and how lines are woven inside triads and between them. Even if you haven’t bought previous classes, this could also be a good place to start (and it will make you want to get the previous offerings too!). The pdf examples (as ever with Steve) excels both in terms of quality AND quantity (24 phrases over 7 pages). Can’t wait for the Open triads instalment! This class is amazing. Steve Herberman have deep toughts about counterpoint and a beautiful guitar sound. Great !